"The portrait we give this month is of the Rev. 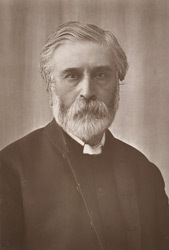 J. Bramwell, of Bramstone Vicarage, President of the Burton-on-Trent Amateur Photographic Association. This gentleman commenced photography in 1879, and since then has been a devoted follower of the art...The Photographic Association is a section of the Burton-on-Trent Institute, which is in connection with the South Kensington Schools of Science and Art, it has not a large number of members, and those meet at each other's houses to discuss their work and the advances made in photography."